Dutch company Vlastuin Truck&Trailerservice has presented the first 'Nextgen' bonneted Scania truck. 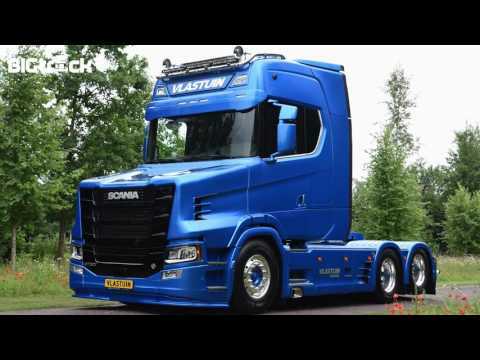 Vlastuin build the truck on the basis of a Scania S730 6x2 tractor and moved the cab backwards. The Vlastuin company has build about 50 bonneted Scania trucks of the previous models. Since Scania stopped producing bonneted trucks Vlastuin made good business in customizing trucks for costumers. With the new model Vlastuin want to continu with his business in the future. All the safety parts of the truck remained the same because the under-grille and front bumper stayed untouched. Also the grille is original. Therefor cooling problems are not espected with this custom made bonneted Scania truck.